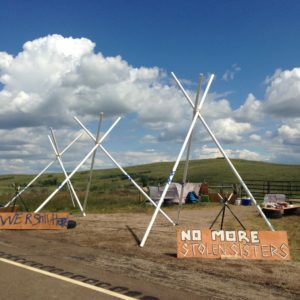 Jaskiran Dhillon continues the “Just Environments” series with a reflection on the Standing Rock Sioux’s resistance to the Dakota Access Pipeline, asking us to consider what this struggle teaches us about the dominant environmental justice movement. Pointing to a longstanding history of settler colonialism, which has heavily relied on environmental destruction and extraction, Dhillon argues that environmental justice must be framed as a struggle for Indigenous sovereignty. She connects Standing Rock to multiple frontlines of resistance around the world, highlighting broader linkages between political strategies advancing decolonization and the environmental justice movement. We live in a historical moment marked by grave uncertainty about the fate of planet Earth. Our children and grandchildren are inheriting a world almost singularly defined by climate change. Temperatures are rising. Oceans are experiencing acidification. Arctic polar icecaps are melting faster than they should. Small islands states are being swallowed up by rising sea levels. The American Psychological Association is mapping the mental health consequences of what they are calling “eco-anxiety.” And, in the midst of this planet-wide crisis riddled with debates about the Anthropocene, Indigenous peoples 1In this essay, “Indigenous peoples” refers to the original inhabitants that occupied the land of Turtle Island (North America) prior to colonization. I am fully aware this term does not signify a singular common identity or lived experience amongst people who are marked or self-identify as such. As Alice Feldman observes of the international Indigenous movement: “[I]n international contexts, Indigenous peoples have sought to articulate a unifying and politically operational identity emanating from their shared experiences of colonialism and goals of self-determination, as well as the diversity of their localized experiences and immediate needs. They have drawn upon cultural traditions, both intact and fragmented, to construct and empower an overarching ‘Indigenousness’ that is simultaneously hybrid. Recognition of their identity as peoples and nations who have legitimate claims to the rights and means of sovereignty and self-determination constitutes the foundation of this collective consciousness and the claims it animates, and serves as a central vehicle for change.” For further reading, see Alice Feldman, “Transforming Peoples and Subverting States: Developing a Pedagogical Approach to the Study of Indigenous Peoples and Ethnocultural Movements,” Ethnicities 1, no. 2 (2001): 147-178. and their longstanding resistance to environmental devastation are clear signposts of who should guide us into the future. One of the most recent and stark representations of Indigenous peoples’ leadership concerning climate change is the historic and epic resistance to the Dakota Access Pipeline (DAPL) led by the Standing Rock Sioux.2Mapping a Many Headed Hydra: Mapping the Struggle over the Dakota Access Pipeline offers an excellent synopsis of the Dakota Access Pipeline and related pipeline projects. See Katie Mazer et al., “Infrastructure Otherwise Report N 001,” 2017. The struggle against this pipeline, now complete and already leaking, and similar acts of violence against the land, water, sky, plants, animals, and ecosystems as a whole is far from over.3For an account of the recent Keystone Pipeline oil spill in South Dakota, which leaked 200,000 gallons of oil, see Robinson Meyer, “200,000 Gallons of Oil Spill From the Keystone Pipeline,” The Atlantic, November 16, 2017. As Trump withdraws the United States from the Paris Agreement and systematically works to dismantle the Environmental Protection Agency, it should be evident that the interests of capital is what matters most to the US government. In the wake of these government decisions, what does Standing Rock teach us about the environmental justice movements and why they must be led by and accountable to Native peoples? Standing Rock, I argue, illustrates that a fight for environmental justice must be framed, first and foremost, as a struggle for Indigenous sovereignty. As I have written elsewhere, the colonial violence that fostered the ruination of the planet has, for the most part, been blurred out of focus in public dialogue. An accurate examination of the social and political causes of climate change requires a close look at the history of genocide, land dispossession, and concerted destruction of Indigenous societies and cultural practices that accompanies the irreversible damage wrought by environmental destruction. Zoe Todd asks the fundamental question: “What does it mean to have a reciprocal discourse on catastrophic end times and apocalyptic environmental change in a place where, over the last 500 years, Indigenous peoples faced the end of the worlds with the violent incursion of colonial ideologies and actions?” Colonial systems of capitalist accumulation, tied directly to the invention of private property, opened the floodgates for “natural resources” to be transported, as Glen Coulthard explains, “from oil and gas fields, refineries, lumber mills, mining operations, and hydro-electric facilities located on the dispossessed lands of Indigenous nations to international markets.” The economic infrastructure in settler colonies, like the United States and Canada, depends on extractive industries. Indeed, Kyle Whyte points out that “in the US settler context, settler colonial laws, policies and programs are ‘both’ a significant factor in opening up Indigenous territories for carbon-intensive economic activities and, at the same time, a significant factor in why Indigenous peoples face heightened climate risks.”4Kyle Powys Whyte, “Is it Colonial Déjà Vu? Indigenous Peoples and Climate Injustice,” in Humanities for the Environment: Integrating Knowledges, Forging New Constellations of Practice, ed. Joni Adamson and Michael Davis (Routledge, 2017): 88–104. DAPL, then, must be viewed as the most recent incarnation of environmental harm that has found its legitimation and footing in colonialism and occupation. A closer look at Standing Rock reveals the Sioux Nation never ceded the 1851 treaty lands that lie at the center of their opposition to DAPL. Nick Estes and Jeffery Ostler remind us, “There is no question about the accuracy of Standing Rock’s contention that the pipeline is being constructed across lands recognized as Sioux territory under the 1851 Treaty.” Following in the footsteps of a long history of violence and encroachment on Indigenous homelands, Energy Transfer Partners, with the support of the federal government, violated this treaty relationship between the US settler state and the Sioux Nation even though treaties are regarded by the US Constitution as the “supreme laws of the land.” In a similar vein, Heidi Stark offers a critical analysis of the ways that the imposition of colonial law allowed the United States to increasingly undermine Indigenous authority and assert jurisdiction over Indigenous peoples and their lands—political moves in direct violation of treaty relationships that actively produce settler state sovereignty over the land.5Heidi Kiiwetinepinesiik Stark, “Criminal Empire: The Making of the Savage in a Lawless Land,” Theory & Event 19, no. 4 (2016). Stark also makes evident how the imposition of colonial law paved the way for the legalization of criminal actions of emerging settler states while casting Indigenous resistance as inherently unlawful and illegitimate.6“The construction of Indigenous resistance as criminal activity produced an environment where Indigenous lands could be legally stolen and Indigenous leaders could be legally murdered under the dominion of settler laws,” in Stark, “Criminal Empire.” The criminalization of Indigenous resistance, which reinforces the power and sanctity of settler law, became glaringly apparent at Standing Rock. Read Richard Hendriks, Philip Raphals, Karen Bakker, and Gordon Christie’s essay for another example of Indigenous Treaty rights infringement here. For example, the horrific violence enacted upon the Water Protectors in frontline resistance camps shows the lengths the state will go to quell resistance against industrial development projects and shut down perceived insurgencies and claims to territory.7Kyle Powys Whyte, “The Dakota Access Pipeline, Environmental Justice, and US Colonialism,” RED INK 19, no. 1 (Spring 2017): 154-169. The Intercept’s series on Standing Rock and police violence revealed that counterterrorism tactics were used at Standing Rock to undertake intrusive and aggressive surveillance of Water Protectors who were criminalized by state authorities. According to internal documents acquired through the investigation, police across at least five states were working in close collaboration with the international mercenary security firm TigerSwan to spearhead a multifaceted response to the growing resistance camps at Standing Rock.8These methods of deliberate political suppression took the form of aerial surveillance and radio eavesdropping, infiltration of camps and activist circles, and the reaping of information from social media—all of which fed directly into FBI and local police tactics of violent containment (e.g., water cannons, armored vehicles, rubber bullets, tear gas, attack dogs, the deployment of snipers, and physical road blockades). As the article explains, “the leaked materials not only highlight TigerSwan’s militaristic approach to protecting its client’s interests but also the company’s profit-driven imperative to portray the nonviolent water protector movement as unpredictable and menacing enough to justify the continued need for extraordinary security measures.” Following Stark, this projection of the Water Protectors at Standing Rock and their allies as criminal and violent—essentially as a threat to the political authority of state power—enabled the United States to divert attention from its own illegal actions and egregious violence against the Sioux Nation.9For an excellent exposition of the hyper surveillance technology and tactics of criminalization used by settler states like the United States and Canada, including the positioning of Indigenous peoples as “extremists” and “domestic terrorists,” see Shiri Pasternak, Grounded Authority: The Algonquins of Barriere Lake against the State (Minneapolis, MN: University of Minnesota Press, 2017). This violent suppression of resistance at Standing Rock raises an essential question: How can we expect the same colonial government that is partnered with an international mercenary security firm enlisted to brutally halt opposition to a pipeline project to work in the service of climate recovery? We can’t. Our strongest chance of restoring balance on the planet and respecting the interconnectedness of all things, human and other-than-human, is to fervently advocate for justice for Indigenous communities and return to them the power of governance—which was violently apprehended through war, genocide, starvation, disease, abuse, the dispossession of land, and forced repression of Indigenous communities on reservations. The only way to upend this form of sociopolitical and economic ordering, I argue, is through the reinstatement of Indigenous authority and sovereignty. The struggle at Standing Rock reverberated across the world. The movement brought international attention and media coverage to the Sioux’s resistance efforts against the decimation of sacred burial sites, the ongoing encroachment of the US government and private corporations on Native land, and the contamination of the Missouri River. One of the reasons this resonance carried so far and wide is because Standing Rock is only one of multiple frontlines of resistance that aim to conceive of decolonization as foundational to environmental justice. Indigenous peoples are not just leading the fight for environmental justice here on Turtle Island, but all over the globe. In North Sikkim, India, for example, Lepcha Indigenous youth went on a hunger strike to protest against the Indian Power Ministry’s plan to develop seven hydroelectric dams as a means to increase energy production in the Himalayan states.13Mabel D. Gergan, “Precarity and Possibility: On being Young and Indigenous in Sikkim, India,” Himalaya, the Journal of the Association for Nepal and Himalayan Studies 34, no. 2, Article 10 (2014): 67-80. Citing the failure of the Indian government to foster employment opportunities in a country beset by endemic poverty and deprivation, these Indigenous youth were critically questioning a state-directed development agenda that does not serve the interests of the community. They were able to garner enough international attention that four out of the seven hydroelectric projects were canceled. 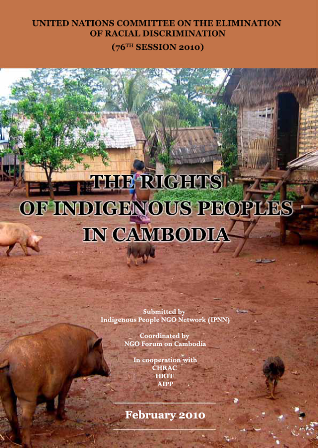 Further exemplifying the plurality of a transnational Indigenous movement14 UN Committee on the Elimination of Racial Discrimination, 2010More Info → at the forefront of environmental action and climate justice, Indigenous peoples in Cambodia are on the frontlines of halting rampant deforestation, land grabbing, illegal logging, and the granting of mining concessions. In the remote province of Ratanakiri, Indigenous communities are making visible the impacts of climate change that have already drastically altered their livelihoods and ways of living. They are calling attention to the contamination of food and water sources caused by development projects that have come alongside globalization—projects that are often positioned by the Cambodian government as beneficial for the economic prosperity of the country. Lack of rainfall has created dire conditions in a country where 80 percent of the population relies on agriculture. One can also turn to Ecuador, and numerous other countries in South and Central America, where Indigenous peoples are vociferously staging a battle against neoliberal economic agendas that have devastated communities, increased poverty and inequality, and threaten the very existence of the Amazon. They are the makers of a political revolution that centers the universal right to water, the protection of biodiversity, and the redistribution of lands unjustly seized. 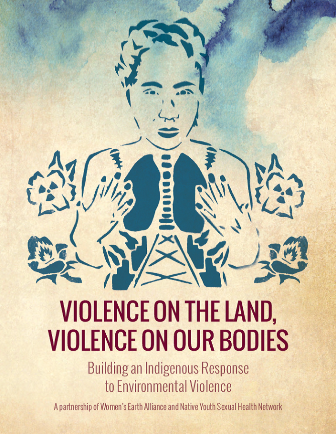 Taken together, this window into the multiple, worldwide struggles to protect the land, water, and air unquestionably shows us that environmental justice is firmly rooted in Indigenous political strategies advancing decolonization. Resistance efforts, like the one at Standing Rock, defy purely localized analysis. Importantly, they remind us of the symbolic and political power the #NoDAPL movement has that can inspire, legitimize, and speak to future similar resistance efforts across a range of locations. As the battle over our planet plays out, this window into resistance also sends a message about who should be leading us. In this essay, “Indigenous peoples” refers to the original inhabitants that occupied the land of Turtle Island (North America) prior to colonization. I am fully aware this term does not signify a singular common identity or lived experience amongst people who are marked or self-identify as such. As Alice Feldman observes of the international Indigenous movement: “[I]n international contexts, Indigenous peoples have sought to articulate a unifying and politically operational identity emanating from their shared experiences of colonialism and goals of self-determination, as well as the diversity of their localized experiences and immediate needs. They have drawn upon cultural traditions, both intact and fragmented, to construct and empower an overarching ‘Indigenousness’ that is simultaneously hybrid. Recognition of their identity as peoples and nations who have legitimate claims to the rights and means of sovereignty and self-determination constitutes the foundation of this collective consciousness and the claims it animates, and serves as a central vehicle for change.” For further reading, see Alice Feldman, “Transforming Peoples and Subverting States: Developing a Pedagogical Approach to the Study of Indigenous Peoples and Ethnocultural Movements,” Ethnicities 1, no. 2 (2001): 147-178. Mapping a Many Headed Hydra: Mapping the Struggle over the Dakota Access Pipeline offers an excellent synopsis of the Dakota Access Pipeline and related pipeline projects. See Katie Mazer et al., “Infrastructure Otherwise Report N 001,” 2017. For an account of the recent Keystone Pipeline oil spill in South Dakota, which leaked 200,000 gallons of oil, see Robinson Meyer, “200,000 Gallons of Oil Spill From the Keystone Pipeline,” The Atlantic, November 16, 2017. Kyle Powys Whyte, “Is it Colonial Déjà Vu? Indigenous Peoples and Climate Injustice,” in Humanities for the Environment: Integrating Knowledges, Forging New Constellations of Practice, ed. Joni Adamson and Michael Davis (Routledge, 2017): 88–104. Heidi Kiiwetinepinesiik Stark, “Criminal Empire: The Making of the Savage in a Lawless Land,” Theory & Event 19, no. 4 (2016). Kyle Powys Whyte, “The Dakota Access Pipeline, Environmental Justice, and US Colonialism,” RED INK 19, no. 1 (Spring 2017): 154-169. For an excellent exposition of the hyper surveillance technology and tactics of criminalization used by settler states like the United States and Canada, including the positioning of Indigenous peoples as “extremists” and “domestic terrorists,” see Shiri Pasternak, Grounded Authority: The Algonquins of Barriere Lake against the State (Minneapolis, MN: University of Minnesota Press, 2017). According to Wilson, the term “two-spirit” is drawn from a traditional worldview that affirms the inseparability of the experience of Indigenous peoples’ sexuality from the experience of their culture and community. For further reflection, see Alex Wilson, “How We Find Ourselves: Identity Development and Two Spirit People,” Harvard Educational Review 66, no. 2 (1996): 303-318. See http://rezpectourwater.com/ for more information on the youth-led Rezpect Our Water campaign. Mabel D. Gergan, “Precarity and Possibility: On being Young and Indigenous in Sikkim, India,” Himalaya, the Journal of the Association for Nepal and Himalayan Studies 34, no. 2, Article 10 (2014): 67-80. Jaskiran Dhillon is a first-generation academic and organizer who grew up on Treaty Six Cree Territory in Saskatchewan, Canada. Her work has been published in The Guardian, Cultural Anthropology, Truthout, Public Seminar, Feminist Formations, and Decolonization among other venues. Her first book, Prairie Rising: Indigenous Youth, Decolonization, and the Politics of Intervention (University of Toronto Press, 2017), provides a critical, ethnographic account of state interventions in the lives of urban Indigenous youth. She is also the guest editor of a special issue of Environment and Society that foregrounds Indigenous resistance to, and theorizing of, climate change and coeditor, along with Nick Estes, of #NODAPL and Mni Wiconi: Reflections on Standing Rock to be released in 2018 with University of Minnesota Press. Dhillon is an assistant professor of global studies and anthropology at The New School in New York City and a member of the New York City Stands with Standing Rock Collective. Previous article What Is Activist Research?